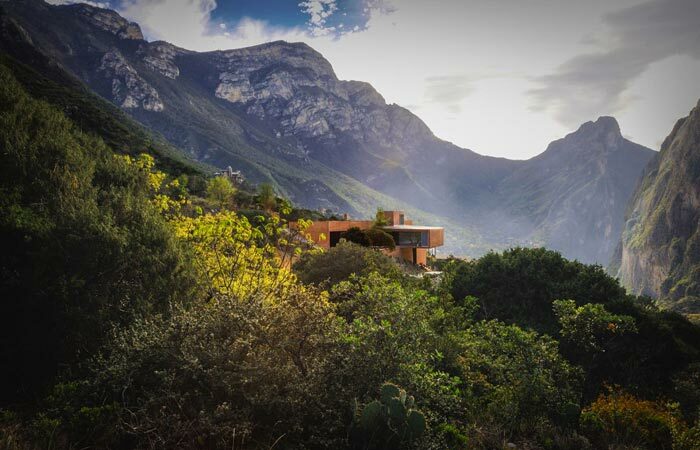 A beautiful luxury residence that seems to blend with the mountainous landscape of El Jonuco, Casa Narigua designed by Mexican architect David Pedroza Castañeda is a secluded home in coastal Mexico overlooking rich treetops and the amazing hillside, evocative of the numerous Mexican towns where residents live alongside with the typical vegetation and local wildlife. 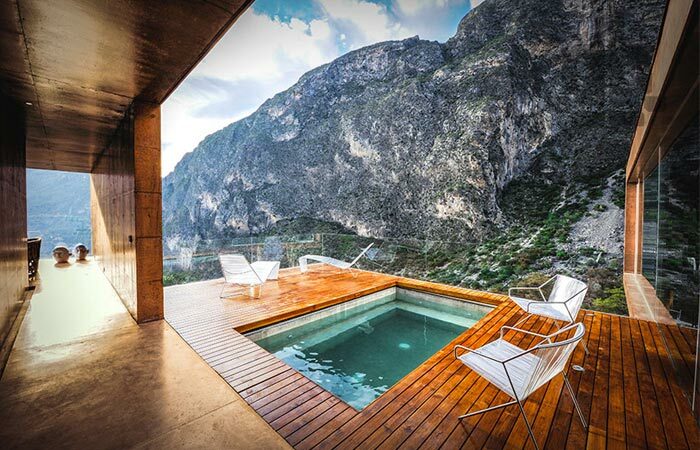 Stretching on some 8,000 square-feet, Casa Narigua offers a spectacular 360 degree view of the surrounding scenery densely populated by local trees. 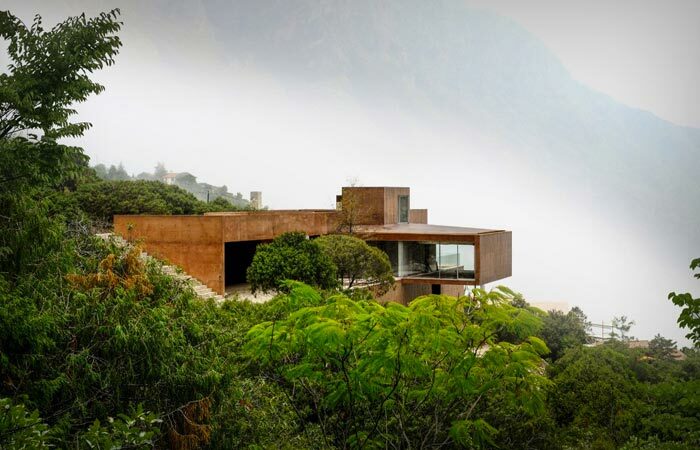 To avoid disturbing the existing wood ecosystem and contend with the uneven terrain while at the same time ensuring an amazing view of the landscape, Pedroza Castañeda decided to build Casa Narigua as a cluster of cantilevered three two-storey blocks that overlap in zones across the site to skirt a group of old cedar trees. The floor plan is thus divided into three zones, the first of which contains the parking garage and storage areas. The second zone holds the entrance hall, master bedroom and the staircase to the lower level, while the kitchen, service and social areas are located in the third volume. The lower level serves as a plinth for the ground floor and it includes two half-buried technical rooms and a number of ‘recyclable’ chambers equipped with furniture that can easily be transformed into guest bedrooms. A staircase leads up onto the expansive belvedere on the flat rooftop overlooking the landscape, and a group of terraces is located on the west side of the house, allowing tourists to enjoy the spectacular sight of two mountains that almost touch. 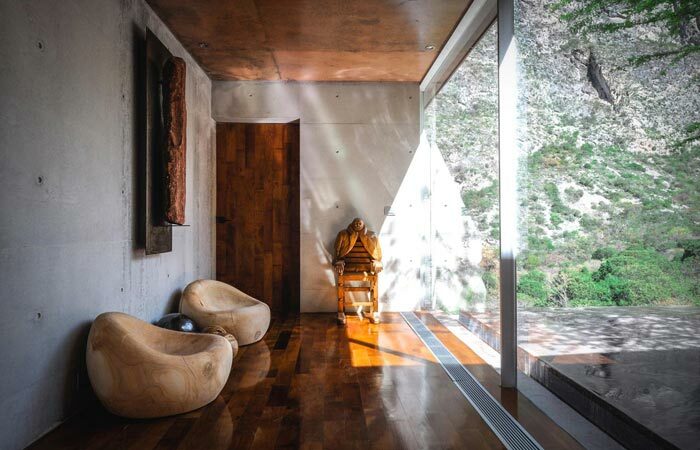 The design of Casa Narigua draws mostly on traditional Mexican architecture, as reflected mainly in the thick walls, hardwood floors, flat roofs and cypress beams. 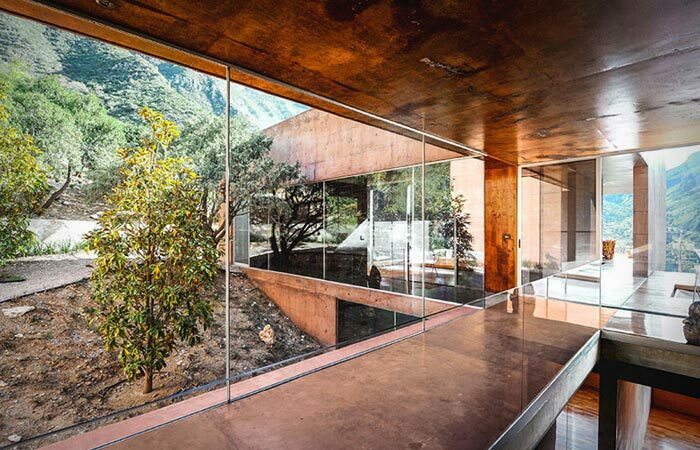 Thanks to the pigmented concrete which lends an earthy red color to the house walls, the house blends with the tone of the groundscape so well that the house can almost be mistaken for a geological accident if viewed from a distance. Enormous floor-to-ceiling windows frame panoramic mountain views and provide abundant lighting. The house is furnished with modern furniture and antiques, made mainly from copper and stained wood for rustic aesthetic, and a number of artwork pieces are displayed in the premises, such as paintings, sculptures and decorative masks. 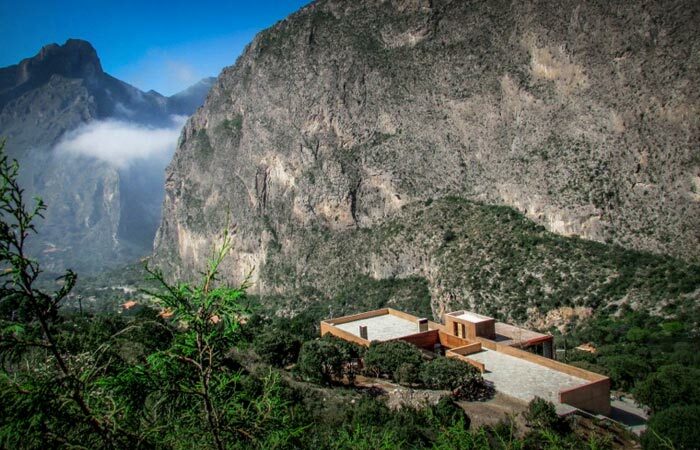 In the words of the architect himself, Narigua House is a stone work humbly placed in an impressive landscape, and it will certainly live up to the criteria of the most demanding among tourists.